The nectarine is a stone fruit related to the plum, cherry, almond, apricot, and peach. 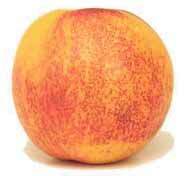 Nectarine flesh tastes and feels somewhat like mango flesh, and almost identical to peach flesh. Freestone nectarines have flesh that separates easily from the pit. Cling nectarines have flesh that clings to the pit. Choose nectarines with a strong and pleasant smell. Nectarines will soften if left around, but will not gain a nice ripe taste and smell. Do not refrigerate nectarines. Use peach recipes with nectarines. This page was last edited on 23 July 2006, at 15:11.